It’s a good thing that my blogging voice has nothing to with my actual voice. Because I hardly have one. It has been a long few weeks of sickness. And to top that off, I know have a complication with a 3 year old root canal. There’s an infection in my gum line because either my root canal is fractured or there’s decaying roots in my gums. I’m an utter mess from my top lip to my collar bone. Fortunately, all of these weird issues have made it pretty easy to stick with my detox diet. The first three days were easy, I ate lots of smoothies, salads, Larabars, and potatoes with beans (It was the easiest thing to make that felt good on my throat). I even came up with a healthy and filling baked apple dessert. Today, however, has been more of a struggle. I had another pb&j smoothie for breakfast, a Larabar as a snack, and then a simple veggie chili for an early dinner/late lunch. It was pretty good for being so simple. (Sorry for another terrible pic, it bubbled up in the microwave and I didn’t feel like dirtying an extra bowl just to get a better looking picture.) 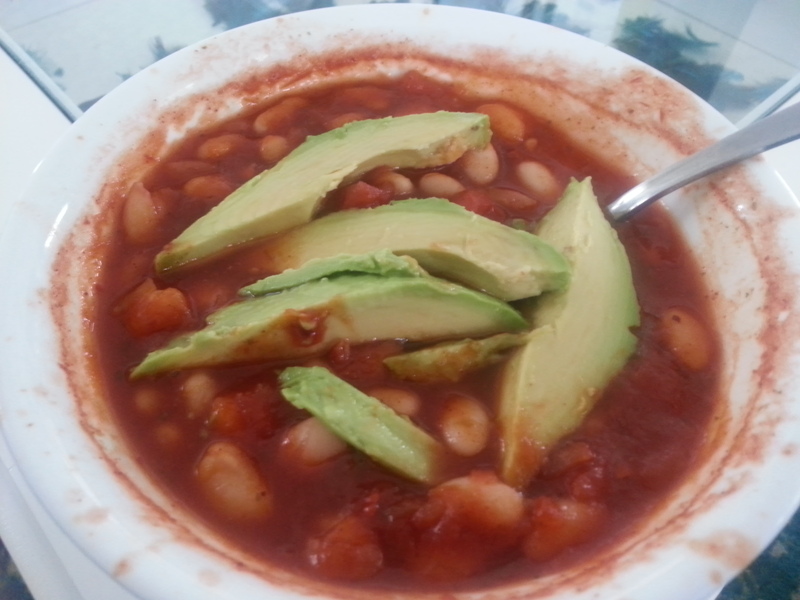 I mixed salsa, veggie broth, and great northern beans with some cumin, paprika, and chili powder. After a couple minutes in the microwave, I topped it with about 1/3 or an avocado, sliced. Sadly, it just didn’t hit the spot. Now here I am, sitting on the couch snacking on potato chips (just potatoes and oil!). I know it’s time to add in some more nutrients. I need some meat. And I need my carbs back! Surprisingly, I don’t miss dairy too much. I’m going to add back in a little bit of dairy. I’m going to finish out today strong, and then tomorrow I’m going to add a few servings of meat, dairy, and grain back each day. I feel a little bad that I couldn’t keep this up for a full 7 days, but I was only planning on 3 and I’ve done 4! My cravings for sugar have pretty much gone away, my skinny jeans fit again, and I’ve lost almost 5 pounds! I’d call that a success. Just 3 more days of really healthy, balanced eating, and I think I’ll be totally back on track! ← Detox Day 2 + Dessert!